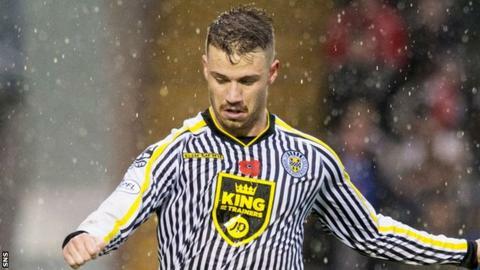 Striker James Marwood has left St Mirren after six months having failed to become a first-team regular. The Scottish Premiership club say the 24-year-old's contract was terminated by mutual consent to allow him to continue his career elsewhere. Englishman Marwood had signed a one-year contract with the option of a further 12 months after leaving Conference Premier outfit Gateshead. But he failed to score in 15 appearances for St Mirren. Marwood, who began his career with Blyth Spartans and won two caps at England C level, was signed by Tommy Craig. However, the manager was sacked in December and Marwood becomes the third striker to leave since Gary Teale became interim player-manager. Adam Drury's loan spell from Manchester City was cut short along with defender Ellis Plummer, while Ross Caldwell had his contract terminated. Marwood wrote on his Twitter account: "Agreed with the club today to leave on mutual terms. "Got so much love for people there learnt a lot! Hope yous stay up!" Teale signed Yoann Arquin after the striker left relegation rivals Ross County but is still looking to increase his options up front. Arquin is free to play against Dundee United on Wednesday night in Paisley, despite being sent off on his debut against his former club on Saturday, after Saints challenged the decision.